Watch your favourite video songs and movies in video player. It supports MPEG4, WMV, AVI, 3GP, 3GPP file types. Listen to your favourite songs in music player. It supports MP3, AAC, FLAC, WMA, WAV, M4A (Apple lossless), MP4, AMR, 3GP, 3GPP, OGG, MIDI etc. file types. It's been quite a while since we last reviewed a BlackBerry handset. Android and iOS have dominated the market for the past couple of years and it's hard to see where exactly a business-centric QWERTY device can fit in. 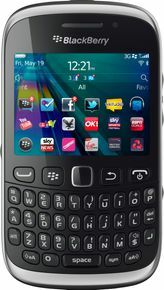 What we like about the BlackBerry Curve 9320 is that it's honest. It's not trying to be better than it is and is quite happy to portray itself as a budget smartphone with a few little extras. RIM no longer produces smartphones that compete with the desirability of Apple products and the younger market which once craved BBM is now rapidly migrating to cheap yet stylish Android smartphones and iPhones which now boast iMessage, a more than capable BBM rival. best phone ive ever had i like it better then my iphone i love everything about it !!! Good phone from RIM having all necessary features required for a smartphone along with the BBM experience.